The drainage basin can be defined as the area of land that draws precipitation into a particular river or river system. Two other important terms help describe its features. The watershed marks the boundary between one drainage and another. This will be characterised by the topography of the drainage basin. Watersheds are usually found along high ridges that divide drainage basins. The catchment area is the area of land within drainage basin itself. These feature can be seen in the image below. The red line, which marks the watershed of the drainage basin clearly follows the higher contours of the landscape. In this way the watershed follows the upper ridges that divide one drainage basin from another. Within the catchment area precipitation will reach the stream via three main paths, surface run-off, throughflow, and groundwater flow. Surface run-off is the fastest and characterised by water flowing over the surface. Following precipitation, surface water will form rivulettes, which then feed into more established tributaries, which in turn feed into the main river channel. The second path to the river is via throughflow. Throughflow is a sub-surface flow within the soil layer. It is not as efficient as surface run-off but once water has infiltrated into the soil it runs downslope according to the contours. It does this via a network of soil pipes created by earthworms and other creatures. Throughflow is most likely on vegetated slopes, where vegetation has intercepted precipitation, preventing rapid run-off. The final way that water enters the river is through ground water flow. If the topography of the drainage basin allows water to pool on the surface it is likely to infiltrate. When the underlying rock in permeable, water may continue to percolate into the rock. The water will then flow through the rock and reach the river either directly through the water table or via a spring. Should the water reach the surface via a spring it will continue on its path to the river as surface run-off. The balance of water in the drainage basin can be seen in its water budget. The water budget is calculated through the formula, P =Q +E - ±S. This interaction between run-off, evapotranspiration and storage is in constant change throughout the year and depends on both the characteristics of the physical environment and climate. The graph to the left shows the water budget for a town in Ghana and shows two distinct seasons. A dry season from November to March and an increasingly wet season from April to October. During the dry season there is a soil moisture deficit, caused by evapotranspiration exceeding precipitation. Between July and September precipitation exceeds potential evapotranspiration leading to soil moisture recharge, In september, there is soil moisture surplus. At this point the field capacity (the maximum amount of moisture that soil can retain) is reached. This will lead to changes in storage and increased throughflow and ground water flow. This same period shows a dip in potential evapotranspiration. This can be explained by increased cloud cover blocking the sun's energy. 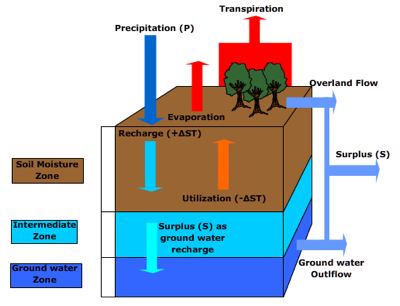 This interaction between run-off, evapotranspiration can be seen in the diagram below. For further reading on water budgets click on the diagram. 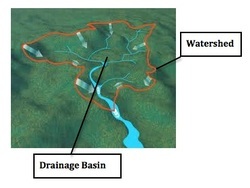 In the diagram below the drainage basin is illustrated as an open system. Its input is precipitation in the form of rain or snow and its outputs can be seen as evapotranspiration and the river flow itself. Remember that the mouth of the river marks the natural boundary of the drainage basin. The other natural boundary is the atmosphere itself. It is only when precipitation reaches the ground that water enters the drainage basin. As you can see in the diagram, there are many transfers and at each layer, be it on the surface or underground there are storages. Precipitation is stored on the surface in snow. This may be for just one season or it may be for several thousand years in the form of glacial ice. Likewise, water can be stored over varying timescales within vegetation, soil or rock. This may be over vast time scales. The transfer of water through the Great Artesian Basin of Australia is thought to take 2 million years. Within the drainage basin there are also multiple feedback loops. Water might rise to the surface through springs due to difference in rock and permeability or as a result of capillary rise. Humans extract water from artesian basins through bores, which pull water to the surface as open springs or more controlled bores. In many places precipitation fails to transfer as run-off. Precipitation is intercepted by vegetation and stored, then transpired back into the atmosphere. In hot and humid conditions, strong thermals develop, which may then repeat the process. This is particularly evident in tropical climates and characterise the daily weather patterns of some equatorial regions. This daily pattern of rainfall, interception and transpiration provide the world with some of its richest and most biodiverse physical environments and most important water catchments that feed some of the world's largest river systems. Click on the image below to link to an excellent flash resource on drainage basin feedbacks.